Beginning on March 14, Coney Island USA’s artist-in-residence Marie Roberts will teach a four-day, hands-on workshop on the art, technique and history of banner painting. 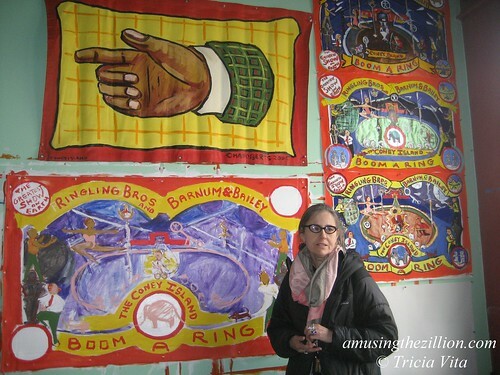 For more than a decade, Marie has painted the banners advertising the Coney Island Circus Sideshow. You can view her work 365 days a year on the CIUSA Building at Surf Ave and 12th Street. According to the course description “Each student will be furnished with one 5 x 4 inch blank, and the use of materials to execute it. Traditional banners will be discussed, sideshow banners from the collection will be on view for reference, instructor will be present at all sessions. Emphasis will be to help the student achieve his/her own large format composition, using the instructor’s years of painting experience. Professor Roberts will paint along with students to demonstrate method.” For more information on “Banner Painting 102” and other sideshow school classes– including fire eating, sword swallowing and glass walking!—visit CIUSA’s website. The pix that appear in this post were taken on New Year’s Day when we visited Marie Roberts studio. The works-in-progress in the first photo are for a banner Marie is working on for Ringling Circus commemorating last year’s performance of the Coney Island Boom-A-Ring. If you look closely, you’ll see Justin Case riding through the miniature ring of fire on his tiny bicycle! 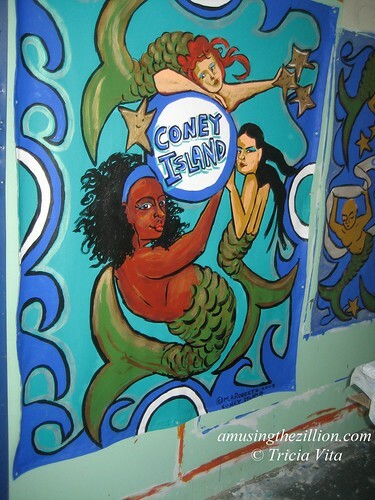 The mermaid banner shown below will be up for auction at the Brooklyn Academy of Music’s upcoming silent auction.